Description: This Striped Clutch features picots along the edge of the flap. By using a second color, and shifting between left and right Square Knots, a symmetrical stripe is formed. 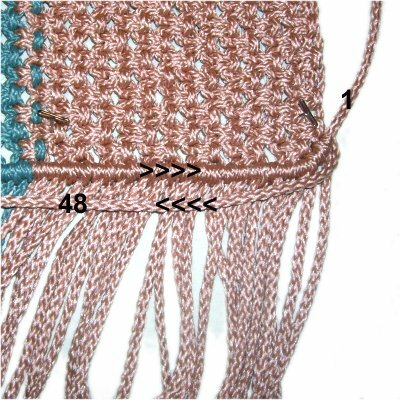 This is an easy Macrame pattern, suitable for a beginner's project. 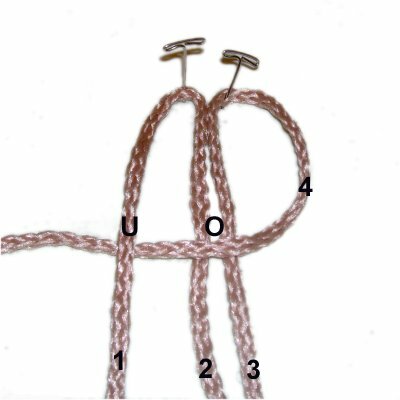 You should have some experience tying both right and left Square Knots, but they are both described as part of these instructions. The finished size for this clutch purse is 9 inches wide and 6.5 inches top to bottom (folded). You can easily make it wider by adding more cords. In the example shown, color A is light brown and color B is turquoise. Cut 20 color A cords, each 4 yards long. To make the Striped Clutch wider than 9 inches, cut additional cords in sets of two, so you have an even number. Cut 4 color B cords, each 4 yards long. Step 1: Fold two color A cords in half and secure them at the center. 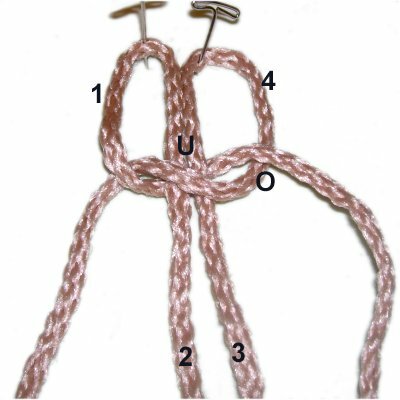 The following images show you how to tie a Left Square Knot to form the picots at the edge of the flap. You can used these instructions to form all the left SK as you create the body of the Striped Clutch. Mentally number the 4 segments, as if they were 4 separate cords. over cords 2 - 3 and under cord 4. 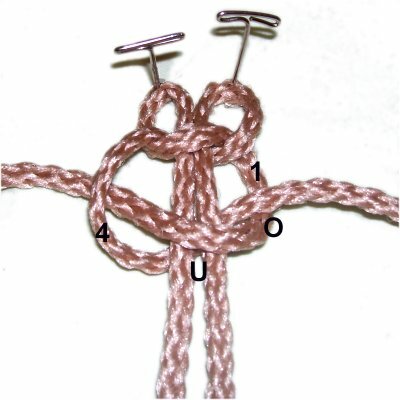 Adjust the first half of the knot so it rests 1/2-inch below the fold (1/2-inch picots). Cords 1 and 4 have switched places, so the direction is now changed for the second half of the SK. << Move cord 1 to the left, over cords 2 - 3 and under cord 4. 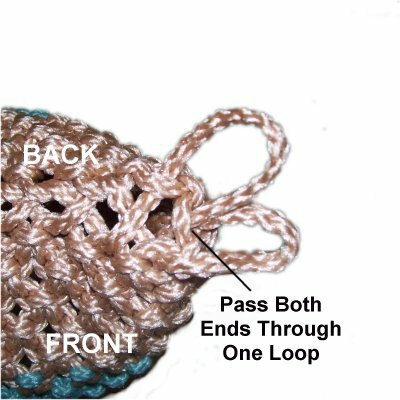 Step 2: Repeat step 1 two more times, so you have a total of 3 picot loop designs (color A). Step 3: Repeat step 1 with two color B cords, creating one picot loop design. 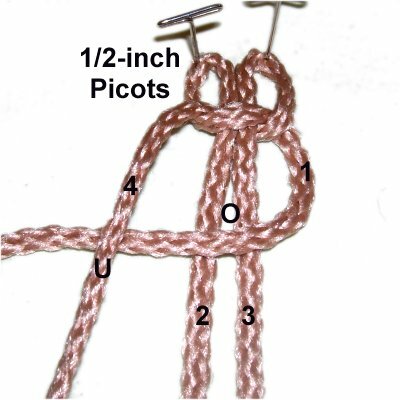 Step 4: The following instructions are for the right Square Knot picot designs. Make at least 7 picots with color A. 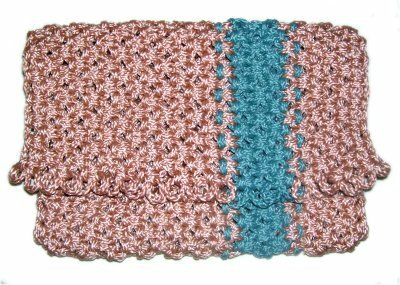 You can create more in this color if you want the Striped Clutch to be wider than 9 inches. 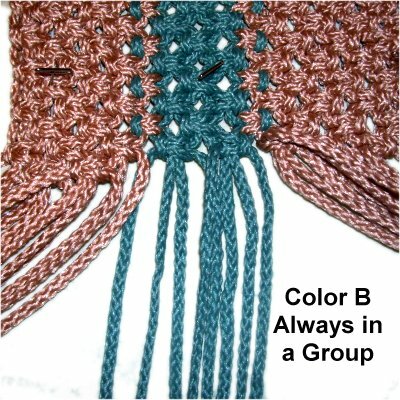 Make one right picot design with color B. << For right SK, you always start by moving cord 4 to the left, over cords 2 - 3 and under cord 1. For the second half, move cord 4 to the right, over cords 2 - 3 and under cord 1. 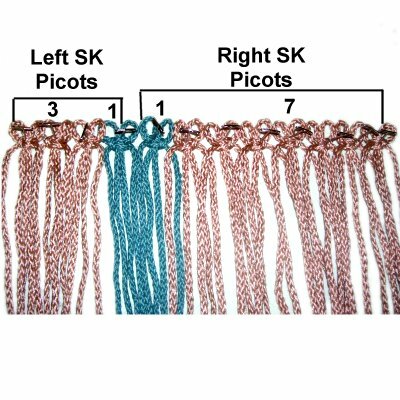 Three color A LEFT picots (steps 1 - 2), followed by one color B Left picot design (step 3). 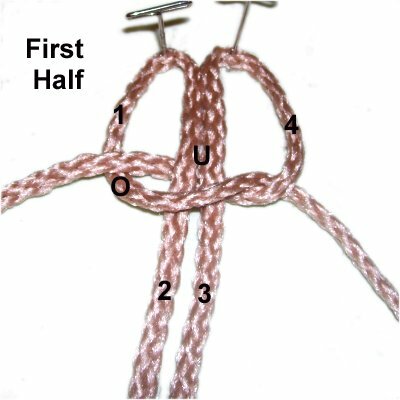 One color B RIGHT picot (step 4), followed by the seven picot designs made with color A. 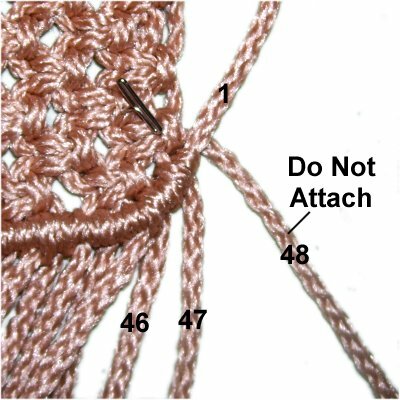 Any extra picot designs you made are placed to the right of the others. The Striped Clutch is made with rows of Alternating Square Knots (ASK). You should know how to alternate cords before starting, so practice if you are unfamiliar with how ASK patterns work. You should start on the left for each row, so the instructions make sense. Mentally number the cords 1 - 48. Pay close attention to the direction of the SK (right or left), since the stripe made with color B is dependent on the direction changes. Left SK: First working cord moved will be on the left. 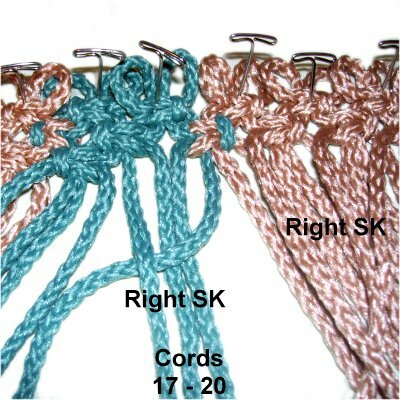 Right SK: The working cord on the right is moved first. 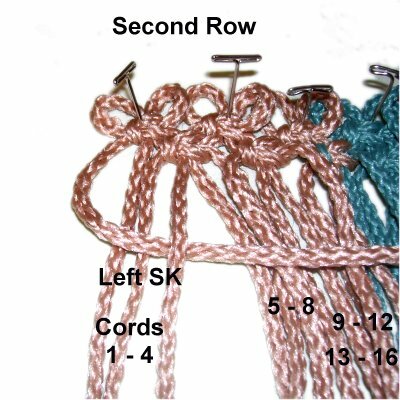 Step 6: The first row is tied starting with cord 3, in groups of four. 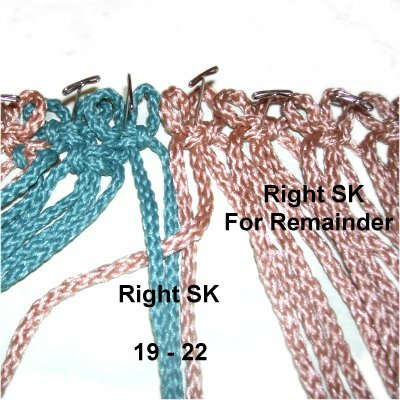 Step 7: You switch to a right SK when you use cords 19 - 22, which is color A and B combined. Step 9: Tie the first right SK with cords 17 - 20, which is color B. 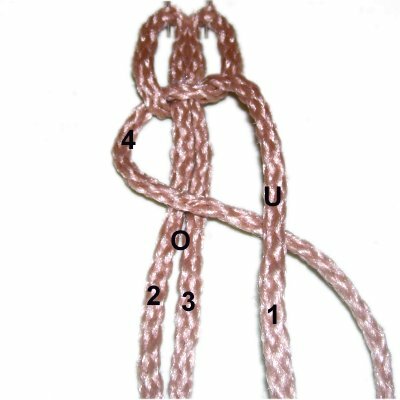 The remaining knots are tied with the following cords: 21 - 24, 25 - 28, 29, 32, 33 - 36, 37 - 40, 41 - 44, and 45 - 48. Step 10: Repeat Step 6, but before you do so, switch cords 2 and 3. So the first left SK is tied with cords 2, 4, 5, 6. Cord 2 needs to be used as a working cord one time, and this is the best place to do it. Step 10: Repeat Step 7, but when you get to the last ASK in the row, switch cords 47 and 46. So the final right SK is tied with cords 43, 44, 45, 47. Step 11: For the remainder of the Striped Clutch, you repeat steps 8 and 9 and then repeat steps 6 and 7. 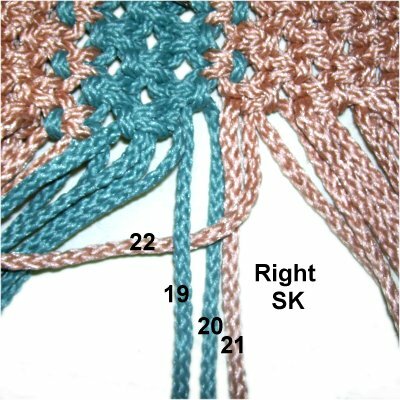 Do this over and over, until the design is 18 inches long (from the top of the picots down to the last row of ASK. Stop on a row where you use cords 3 - 46 (steps 6 and 7). 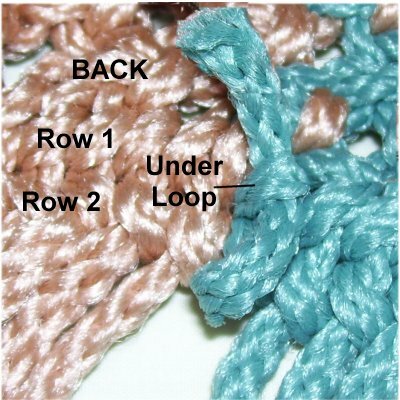 Before you start each row, check to make sure that the color B cords are always in a group. It's easy to switch cords around accidentally, and in this area that's BAD. So be careful when you are in the striped area, and pay close attention to the position of the cords (see next image). In rows where you repeat steps 6 and 7, the two colors are mixed at the stripe. 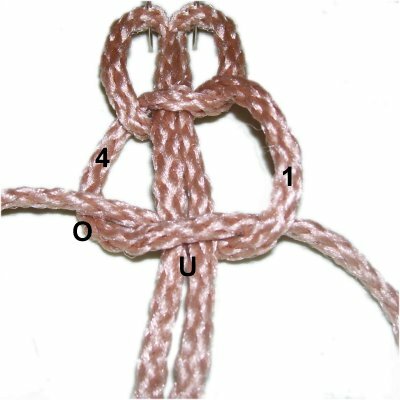 You will always start the Square knot with the color A cord. 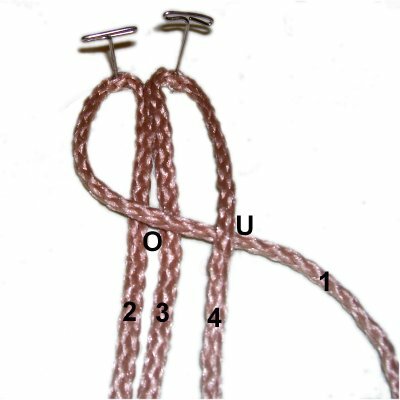 In this case, that's cord 11, since you are tying a left SK. 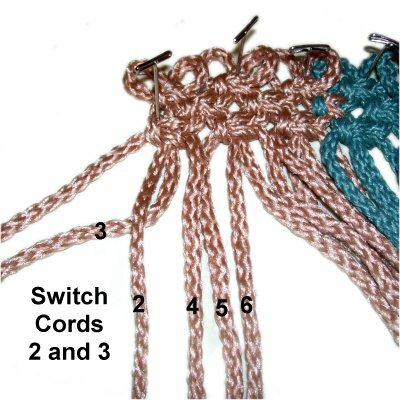 In the same row, the next mixed color knot also begins with the color A working cord. In this case, that's cord 22, since you are making a right SK. 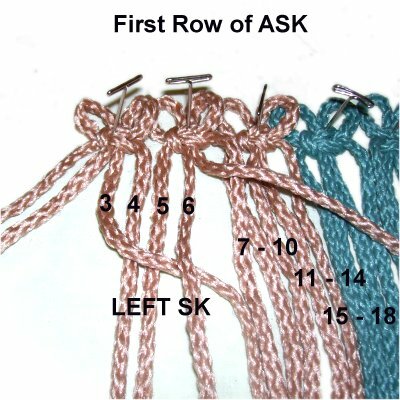 The final detail you should follow is that the first FOUR knots in each row are all left SK, and the rest are right SK. Again, the Striped Clutch is dependent on accurately switching directions at the proper place. The stripe won't be symmetrical otherwise. The front edge of the Striped Clutch is made after all the ASK are tied. 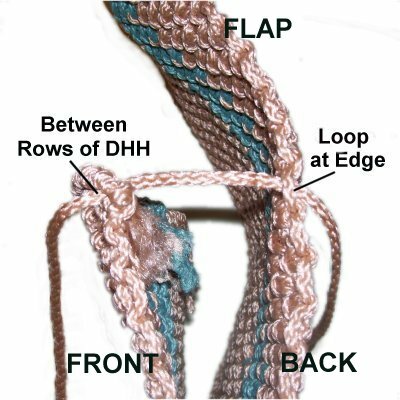 Make sure you know how to tie Double Half Hitches (DHH). Step 12: Move cord 1 to the right, resting on top of all the other cords. It will be the holding cord for the first row of DHH. Step 13: Attach cords 2 - 47 to holding cord 1 with DHH. 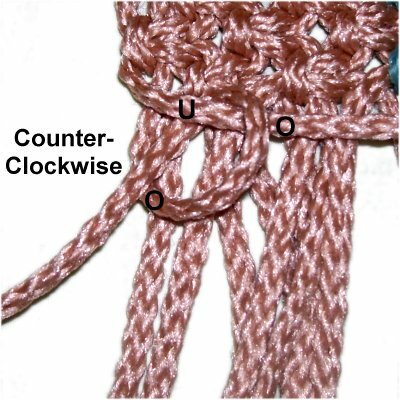 Rotate counter-clockwise when making each loop. Tighten each knot firmly. The bar that forms should rest against the last row of ASK, and be curved at the left and right edge of the purse (see next image). As you progress, push the knots as close together as possible so you have room for all the cords. 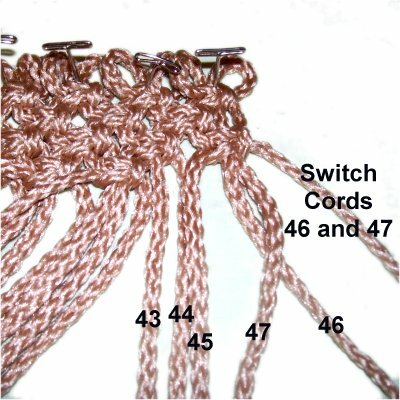 Make sure you do not attach cord 48, which is the last one on the right edge of the Striped Clutch. Step 14: Move holding cord 48 to the left, positioned just below the first row of DHH. Attach cords 47 - 2 with clockwise DHH, in that order. Pause when you reach the area with the stripe. Step 15: Finish off the cords by trimming each one down to 2 inches. Turn the Striped Clutch over, so you are working in the back. 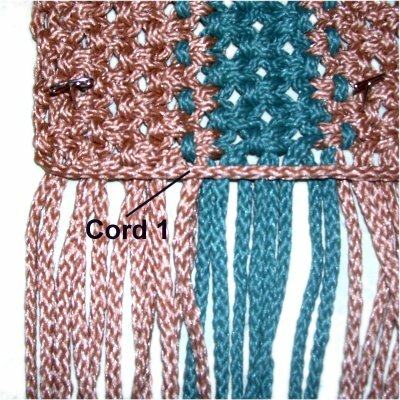 Slide each cord under a loop made in row 1, which is the row next to the ASK. Use tweezers or fine tip pliers as needed. This purse should be lined, covering the cut edges of the cords. If you do not wish to do so, trim the cords a little more, and apply glue to adhere them to the inside surface. When using synthetic materials like nylon, you can heat the tips with a flame to melt the material and prevent fray. Step 16: Now it's time to lace up the sides. Start by measuring the Striped Clutch from the picots down to 5 inches. That's the flap, so fold it at that point. Move down 6.5 inches and fold it again, which divides the back from the front. The portion with the DHH is considered the front. Hold the purse between your knees, or stand it up on one edge. There are loops along the edges of the purse, between the rows of ASK. Match up the loops on the front and back portions (not the flap), so they are directly across from each other. There should be one loop at the fold between the back and front. Use two 18-inch pieces of scrap cord, or cut two new ones, to lace up the sides. Step 17: Slide the lacing cord between the two rows of DHH, as close to the edge as possible (front of purse). Slide it through a loop directly across from it (back of purse). Step 18: Cross the two ends of the lacing cord and then pass them through the next set of loops. Make sure you pass them from inside to outside. Step 19: Repeat step 18 several more times, passing the ends through the other loops, until you reach the folded area between the back and front. 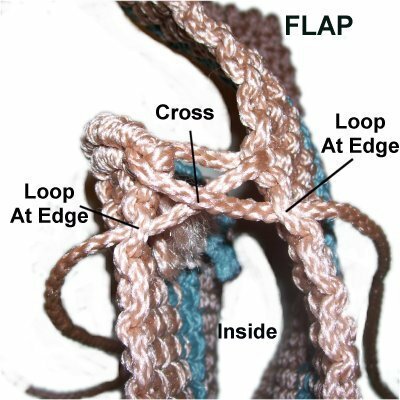 Pass both ends through the same loop at the fold, pushing them to the INSIDE of the Striped Clutch. Make sure the lacing is tight before you move on. Step 20: Turn the purse inside out, so the lacing cord is on the outside and easy to work with. 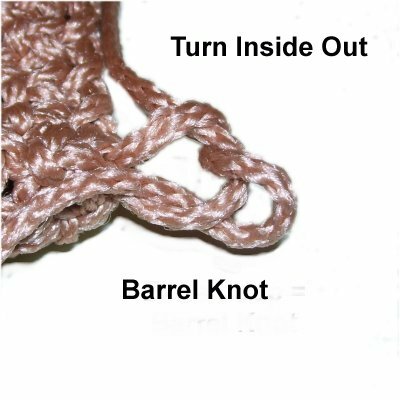 Tie a Barrel Knot to secure it (Overhand Knot + Extra Loop). Trim the material off close to the knot and apply glue. You can melt the material with a flame if using synthetic cord like nylon. Step 21: Turn the Striped Clutch so the cut ends in the front are on the inside. You can now sew a lining into it, directly over the ends. The best place to stitch it in the front section is between the two rows of DHH. There's plenty of space for a needle and thread. Have any comments about the Striped Clutch? Contact Me.